This colorful and delicious Asian Coleslaw Recipe makes the perfect side to any BBQ. It's loaded with crunchy veggies, sweet mandarin oranges, and roasted cashews and tossed in a (mayo-free!) 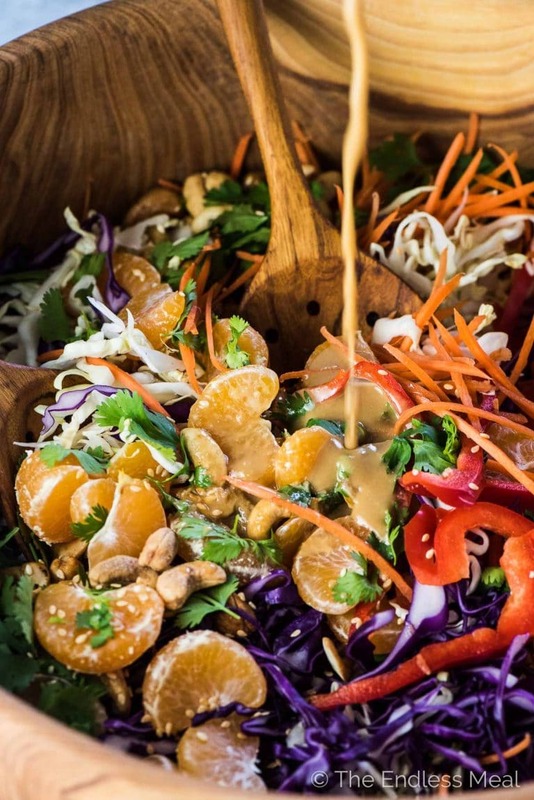 creamy orange sesame dressing. You will LOVE it! Salad season has officially arrived and I have the most delicious Asian coleslaw recipe for you. 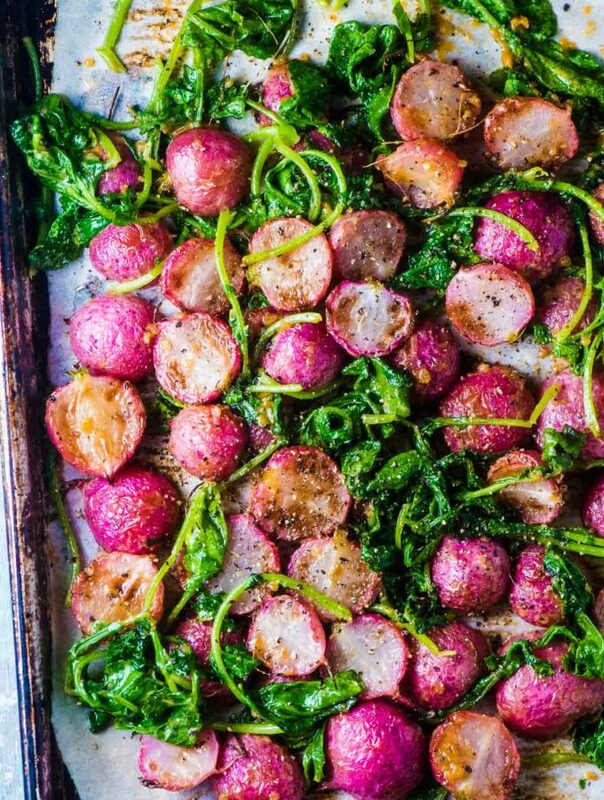 It is delicious enough to eat as a stand-alone, veggie-loaded meal but I love it as a healthy side for whatever I've got sizzling on the BBQ. Any coleslaw is only as good as what it's tossed in and this Asian coleslaw is tossed in a sesame mandarin dressing that is INSANE. It's seriously delicious enough to warrant that full caps yelling. Creamy from the tahini (no mayo!) 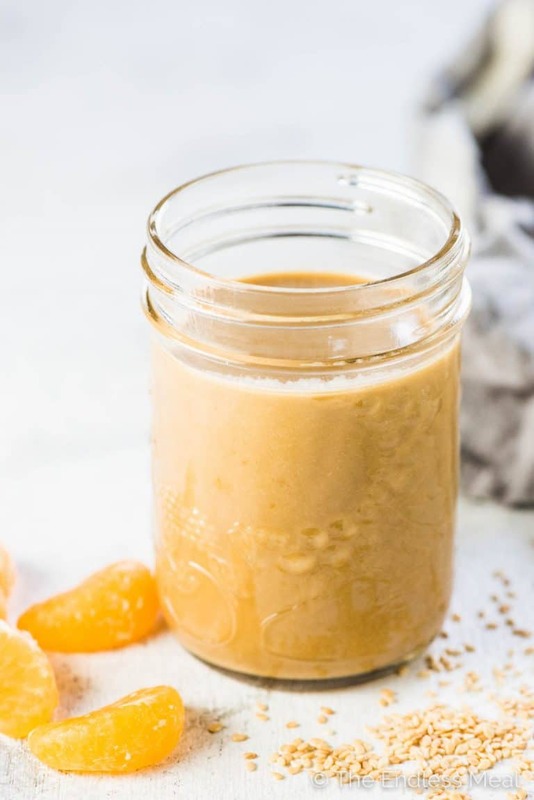 and sweet from the juiced mandarin and a little honey or maple syrup, this salad dressing is bursting with flavor. Mandarins. Because there are no better oranges. Cashews. Or roasted garlic cashews because they are the best things ever. All the crunchy veggies tossed together like a pretty rainbow. Don't get me wrong, there's a time and place for mayo-based coleslaw dressings. But when your coleslaw is sitting out for an hour at a picnic or BBQ, you want a mayo-free dressing. Or when you're trying to lighten things up, mayo-free is the way to go. This Asian coleslaw dressing has the perfect mild creaminess from a little tahini. ← also big-time flavor going on here because of that sesame paste. Step 1: put everything into a jar and give it a good shake. Step 2: celebrate that there is no step two! ? See those cashews up there? Those delicious little things are garlic roasted cashews. And they're the best things ever. 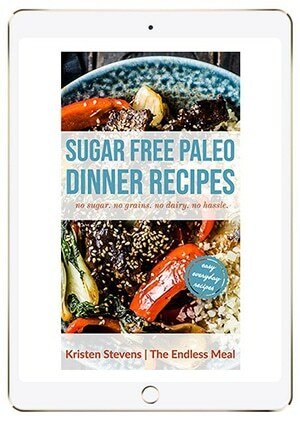 If the store you shop at carries something similar, buy them! If not, buy roasted and salted cashews. 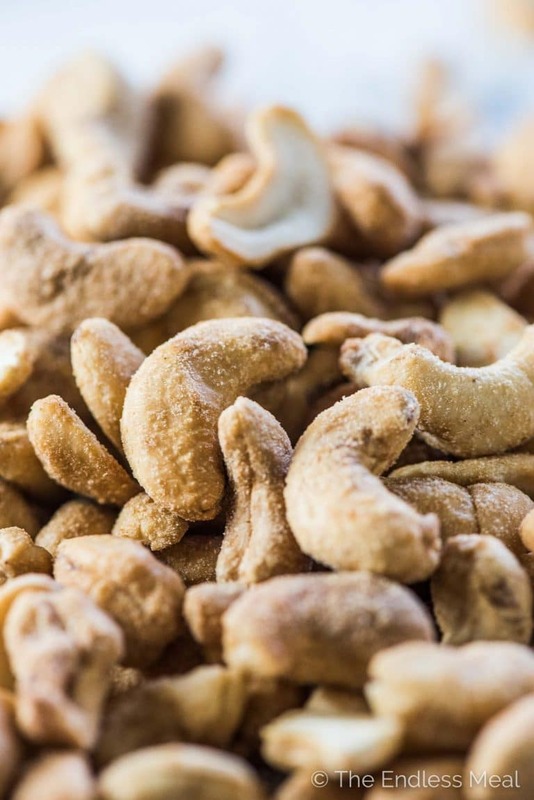 But always be on the lookout for garlic roasted cashews. They're pretty much life-changing. 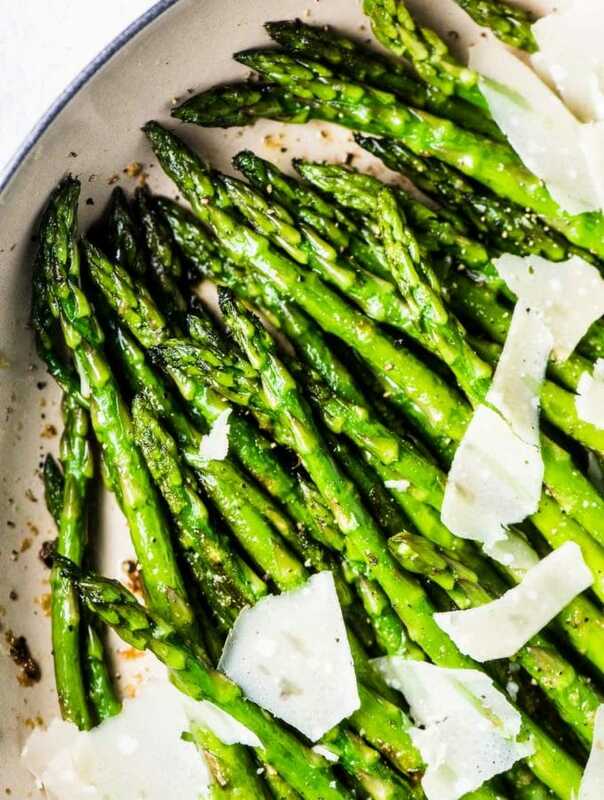 One day I'll experiment with making my own with some garlic powder. When I do, you'll be the first to know. See that perfect salad dressing pour up there? I owe a shout out to my dad for that one. He's often a TEM taste-testing guinea pig when he comes over for dinner. This time I put him to work with the photoshoot. Thanks for the help, dad! I'll pay you with burgers and Asian coleslaw anytime. And if you're looking for another delicious summer salad recipe, check out my Greek Salad Recipe! This colorful and delicious Easy Asian Coleslaw Recipe makes the perfect side to any BBQ. 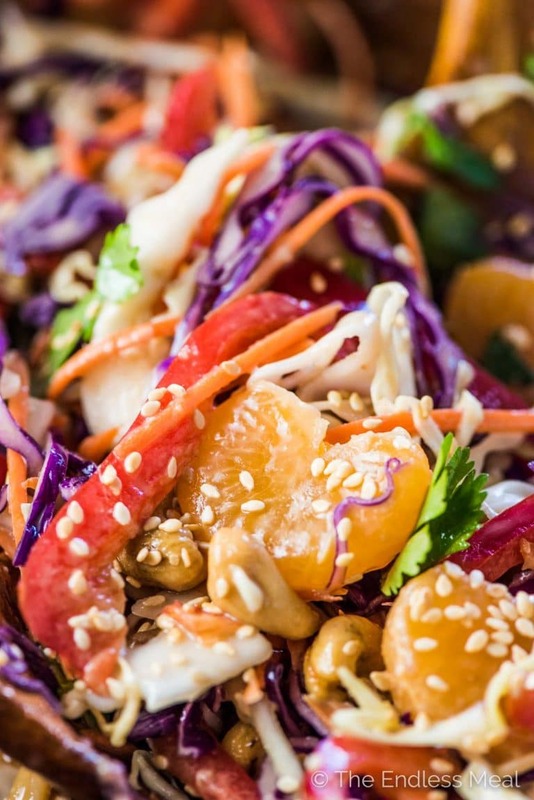 It's loaded with crunchy veggies, mandarin oranges, and roasted cashews and tossed in a (mayo-free!) 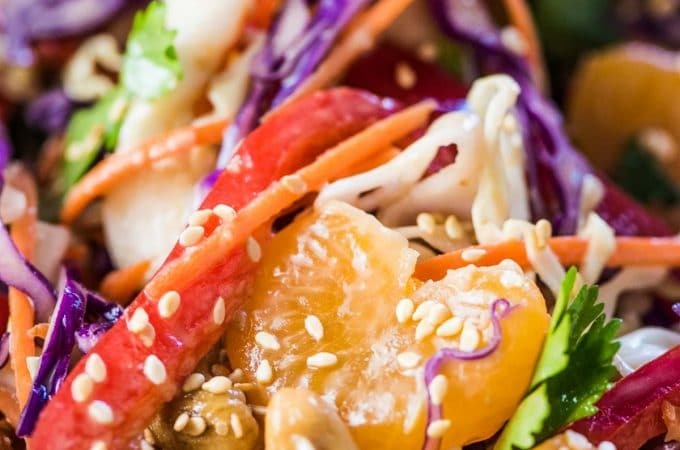 creamy orange sesame dressing. You will LOVE it! Place all the ingredients in a 2 cup glass jar and give it a good shake. It's ready to go when it's creamy. Note: if your tahini is very thick, mix it with the orange juice first then add the rest of the ingredients and shake. Add all the Asian coleslaw ingredients to a large salad bowl. Pour the dressing over the top and toss to coat. All I have to say is WOW! I made this for a bbq party this past weekend and everyone raved about it. Thank you! Awww thanks! I’m so happy everyone loved it! I think I’ve eaten a salad at least every single day for the month of May and thus far in June! I am SO ready for salads this summer. 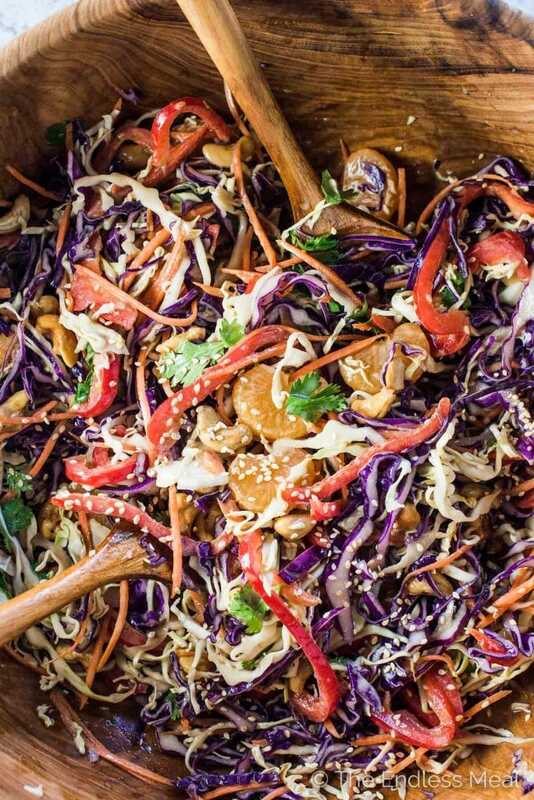 This Asian coleslaw salad looks too perfect–I might make it for my first Food Science club meeting and see how it turns out! It feels so great to eat big salads all the time, doesn’t it?! Yay for salad season! You are so awesome! Thank you for sharing that recipe!